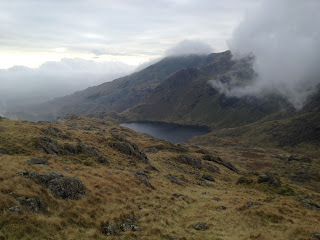 Outdoor Courses for Scrambling, Climbing, Kayaking & Mountain Activities: Kendal Film Festival 2012. November 15th - 18th. Kendal Film Festival 2012. November 15th - 18th. 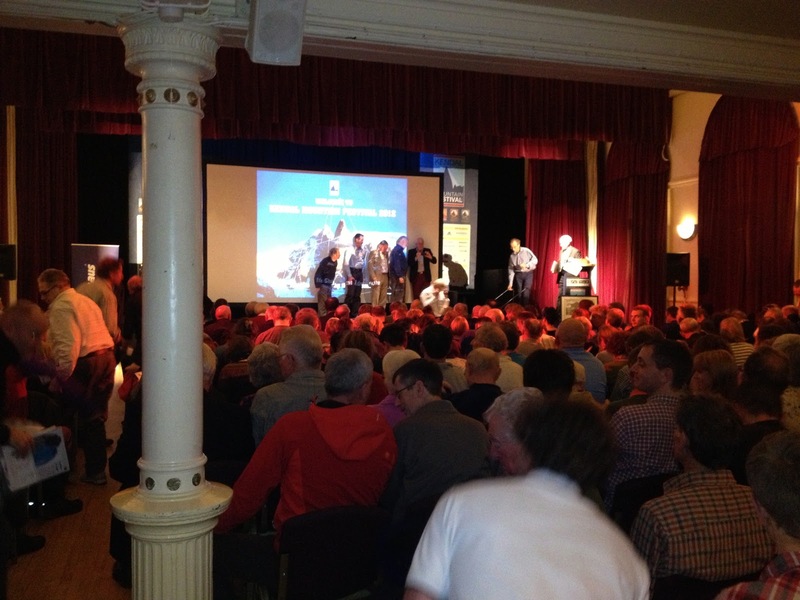 The Kendal Mountain Festival has become something of an annual ritual for us at Kendal Mountaineering Services - just as it has for scores of climbers, hillwalkers, paddlers, expeditioners and other enthusiastic outdoor folks. Undoubtedly the best of its kind in the UK, the KMF is an ideal opportunity to see some of the best known speakers and adventurers at the top of their game present some truly inspirational lectures, talks and films as well as just generally meeting likeminded people. It is also a great opportunity to come together and socialise and that is exactly what we did again this year. Since 2009 we have been joined by past clients of ours - Chris Upton & Adam Dawson, descending on us from opposite ends of the country. Unfortunately this year Adam couldn't make it, but instead we were joined by Dave Mycroft from Myoutdoors who was covering the festival from a journalistic point of view. Dave has been involved with Kendal Mountaineering Services from its beginnings in 2005. During previous Mountain Festivals, we have made it an interesting mix of both hillwalking and attending various KMF events and this year was no exception. Chris (orange jacket in photo two) was, as always, keen to bag a few wainwrights, so we took a walk on Thursday around the Coniston fells (photo one) taking in Wetherlam, Swirl How and the Old Man. As you can see, it was a truly atmospheric, but pleasant day out. By contrast, Friday was nowhere near as nice. Photo two is taken near to Red Tarn as we attempted to traverse Crinkle Crags and Bowfell from Oxendale with the cloudbase at around 200m and it was to remain at this level all day. Chris had bought his bright orange Arcteryx jacket the previous evening at the Planet Fear sale in the Basecamp tent at the Brewery Arts Centre. Iain, on the other hand was wearing the new Berghaus Ilam hydrodown jacket - on test via Myoutdoors. The latter part of the day was miserably damp but this down jacket performed really well - largely keeping Iain dry, but more importantly - comfortably warm despite the conditions. Iain reckons Berghaus are on to a winner with this product and looks forward to testing it out as a belay jacket in Scotland in the new year. You can read his test report on the Ilam jacket here. Thursday evening found us at Kendal Town Hall for the Boardman Tasker 30th Anniversary Commemorative Event (photo three) To celebrate this event were well known authors of mountain literature such as Doug Scott, Chris Bonnington, Andy Cave, Roger Hubank & Stephen Venables who talked about their experiences and achievements over the last 30 years and for us it was an excellent start to the KMF. As already mentioned, Friday was a rather wet day out on the hill. Friday evening found us all in the Malt Room at The Brewery Arts Centre for the Mountain Equipment pub Quiz hosted by Andy Kirkpatrick. Well, with Andy doing it - it was bound to be fun and it was. Our team won second prize and for that we each got an ME T shirt and a DVD of Dave Macleod and Andy Turners ascent of the Long Hope on the Island of Hoy last year. The long hope was featured at the KMF 2011where it received the peoples choice award. We saw it then - an excellent film indeed! So that was Friday. Saturday morning found us in Screen One,The Brewery, for Andy Caves Alpine Extremes Lecture in which he told us of his inspiring journey of climbing exploration - from Bridlington to Pakistan, from Shetland to China in which he relived some of his greatest climbs & travels. There was also some great film footage of a hard new route he recently climbed in the Alps with Twid Turner who, along with fellow British Mountain Guides Owain Jones & Andy Nelson was also presenting at the film festival. At some point during Saturday we were once again in the basecamp tent looking for bargains. Dave Mycroft snapped Iain trying out the new Petzl Sirocco helmet - made from expanded polypropelene. You can have it in any colour - so long as it's orange! The Afternoon saw us back in the Town Hall where Will Gadd presented his lecture Survival Strategies for high risk situations and talked about his adventures, achievements and tools for survival in the mountains & life that he has learned "both the fun & the hard way". After a short pause we were back at the Brewery for Karen Darkes presentation in the Theatre. A runner, climber & allround outdoor addict Karen was paralysed from the chest down following a climbing accident at age 21 but this hasn't stopped her from continuing to have great adventures in the outdoors. Pictured in photo five talking to Iain's partner Kirstin - she is a hugely motivated and inspirational person and her lecture was just great! The rest of the evening was spent not at the Rab Party but upstairs in The Vats Bar in The Brewery where we enjoyed pizza, beer and a good crack and catch up with the many people around that we knew. After a liesurely start on Sunday Iain & Chris returned to The Brewery Arts Centre to watch the Climbing 2 film presentations in Screen 2. Here we saw six films by people such as Nick Bullock who turned from being a prison officer to a leading mountaineer, A documentary about Cockermouth Mountain Rescue Team, The Gimp Monkeys - a film about the first all disabled ascent of El Capitan, Dave Macleod on a recent bouldering project in Switzerland, a film about three climbers trip to Namibya for a true climbing adventure and finally a film by Alex Honnold - recently described as the boldest soloist of his generation which finished with his solo climb of Mount Watkins, El Capitan and Half Dome - all done one after the other in under 19 hours and some of it in the dark by headtorch. Truly gripping stuff! And after that.......that was it for us. Another Mountain Festival over. Chris departed for Scotland and Iain retired to the Vats Bar for another pizza & pint before heading home, well satisfied with another fantastic Kendal Mountain Festival. The next Kendal Film Festival is taking place during November 14th - 17th 2013 We hope to be there again and maybe you'll join us. Maybe we ought to get more involved? Kendal Mountain Festival, Kendal Mountaineering services.......there is definitely a connection, in fact - there are lots!